The organiser of the Monaco Yacht Show, Informa Exhibitions, announced today (March 2) that it has bought Yachting Promotions, the operator of three of the largest boat shows in the USA. The deal, which is worth $133million, will see Informa take over the Fort Lauderdale International Boat Show, Yachts Miami Beach and the Palm Beach International Boat Show, as well as the smaller St Petersburg Power and Sailboat Show and the Suncoast Boat Show in Sarasota. The acquisition will see Efrem ‘Skip’ Zimbalist III, show organiser and chairman of Active Interest Media, stay on to advise Informa during the transition period. “We can think of no better company than Informa Exhibitions, with its global resources, to focus on the continued growth and success of these excellent boat shows while continuing to exceed the expectations of their exhibitors and attendees,” he added. The largest of the five shows to come into the Informa Exhibitions portfolio is the Fort Lauderdale International Boat Show. Hosted in Florida every November for the past 57 years, the show is described as the largest of its kind in the world. Its 1,300 firms exhibit more 1,200 boats, which regularly attract in excess of 100,000 visitors to the city. The Marine Industries Association of South Florida recently signed a 30-year agreement with the organisers of the Fort Lauderdale show, but CEO Phil Purcell told Boat International that this agreement will not change, adding that the acquisition "allows for an exciting international opportunity". "We look forward to continued collaboration with our partners based on a relationship that has been built over decades," he added. 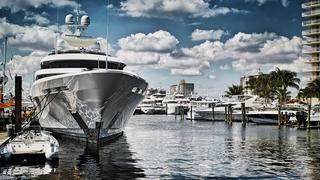 Another key part of the deal is Yachts Miami Beach, which recently introduced an admission fee for the first time in its 30-year history — a move that was widely praised by the brokerage industry. Cindy Sailor, executive director of the Florida Yacht Brokers Association, which co-owns Yachts Miami Beach, was equally upbeat, saying: "I think that this is a great opportunity." "It will give our shows visibility to a much larger audience of international clientele, in addition to giving us access to exhibition expertise we may not currently be employing," she added. "I see a lot of positive upsides for all parties."